MidTown Mobile is considered to be a historic district in the city of Mobile, Alabama. The buildings and homes in the surrounding area range in age from the 1880s to the 1950s and cover a wide variety of architectural styles. 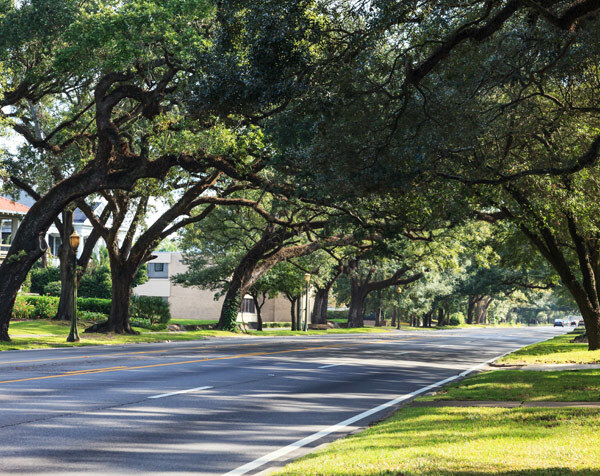 Strolling through this historic district, you’ll discover ancient live oak trees and magnolias forming canopies over our city streets, ferns swaying in the breeze, flowers blooming year round, and beautifully designed front porches aligning the antebellum styled homes. The many squares and parks scattered throughout the city, lined with benches, water features, statues and amazing landscaping. Bienville Square, anchored by an elaborate wrought-iron fountain, has long been the site of social and civic gatherings and to this day, hosts weekday lunches-in0the-park, holiday festivities, culinary cook-offs and charitable fundraisers. Cathedral Square, the ‘front yard’ of the Cathedral Basilica of The Immaculate Conception. Another popular public gathering space, Cathedral Square has served as a backdrop for generations of family, senior and prom pictures and in the spring and fall, the square hosts a farmers market, art festivals, music concerts, fashion shows and more. Washington Square in the Oakleigh District or British Park in the Church Street Historic District, that serves as the social and cultural hub for these neighborhoods, as well.